Atlantic salmon have silvery to yellowish brown sides with dark spots. This nutritious fish can also resemble brown trout, but the tail is slightly forked rather than square. Atlantic salmon is nutritious and is low in sodium. It is also a good source of Niacin, Vitamin B6, Phosphorus and a very good source of Protein, Vitamin B12 and Selenium. 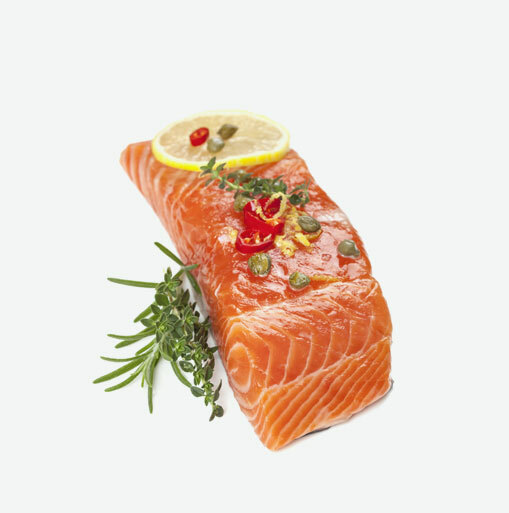 Atlantic salmon is high in omega-3 essential fatty acids which helps brain function and is good for the heart. • The body should be swollen, shiny and smooth to touch. • The gills should be bright and moist. • Look for a firm or stiff abdomen without any tears or cuts. • The skin and scales should be fresh, moist, smooth and not flaky or dull. • The meat should be firm and elastic and should not stay indented when touched. • The blood should be red and shiny and not a chocolate brown colour. • Brittle or broken tails suggest that the fish has previously been frozen and defrosted. If this is the case, it should be marked as such. Fish should be purchased as near as possible to when you are going to cook and enjoy it; for best results, buy, cook and consume the fish on the same day. The healthiest ways to cook fish are grilling, steaming and baking. When grilling fish, the flesh should be brushed with a little olive oil to prevent it from drying out, and often lemon juice is sprinkled over the fish to give extra flavour. The fish can be enhanced further with herbs and seasonings, making this a very tasty method of preparing fish. Fish can be baked in a mixture of oil or butter as well as other ingredients; this is still a healthy way of cooking your fish, as only small amounts of fat are used. The fish may be wrapped in parchment paper or aluminum foil to prevent the flesh from drying out to keep the flavour in.